Leading the marina waltz, Sea Ray's new Sundancer offers genuine innovation, sportscruiser performance and practicality, writes David Lockwood. Where a marina was once nothing more than a parking lot, today it is a destination in its own right. That bodes well for future owners of the new Sea Ray 375 Sundancer. An ideal boat on which to stage a marina crawl or get away from it all, the 375 plugs into the lifestyle portals. 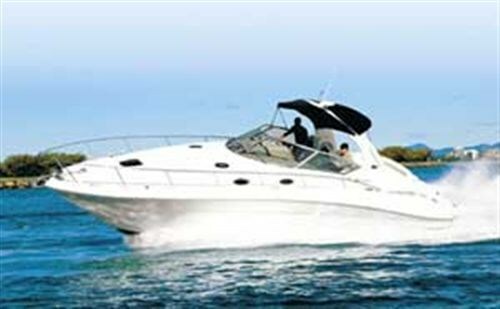 The American sportscruiser has twin 320hp 6.2lt multipoint injected petrol engines to get you across the bay, up the harbour, or down the Broadwater in the blink of an eye. The hull has the seaworthiness to negotiate the open ocean and carries sufficient fuel to reach nearby ports. At your next port of call you can head for the visitor's berth at the marina or try a waterfront eatery instead. Either way, the optional bowthruster fitted to the demo boat will have you parking like a pro. Walkaround decks cater for the crew tending mooring lines and fenders. Look closely and you will notice the details that separate this sportscruiser from many others. For example, all the deck fittings live in dedicated recesses so they are close at hand, but not a threat to bare toes. Angled toe rails, hand rails and a useful bow rail help the passage from the cockpit to the foredeck, which makes for an all-over accessible boat. Inside the aft fender locker you will find twin heavy-duty double shorepower leads so you can run the optional 12,000 BTU air-conditioning system and 240V appliances plus battery charger. And while there is a 4kVa Kohler genset as standard, the shorepower option lets you and your neighbour stay cool. There are also connections for plugging in dockside fresh water, cable television and a phone line in case you want to dial a pizza. Hey, you could even surf the net or check e-mails from your laptop. Even when tied to the marina, the 375 looks like a handy-sized and sporty boat. There is rakish styling and terrific mouldings thanks to a five-axis milling machine. The use of clever space is due in part to CAD software. While it measures just 11.4m (37ft 6in) overall including the swim platform, the boat flows like something much bigger. Things such as a double-width helm seat, loads of headroom down below, a separate lounge area that converts to a second cabin, and broad decks add to onboard comfort. But it's the genuine innovation from Sea Ray, a company not afraid to lead by example, that makes this one of the more interesting 30-something sportscruisers. First time around I thought the drive was the highlight. On my second visit I found a lot more to the 375 Sundancer. While it will be at home tied to the marina, the boat has self-sufficiency for swinging on the anchor. There is also a deck loaded with lifestyle amenities for entertaining a crowd, or a cruising couple with holidays to burn. The big boarding platform has room for a director's chair or two. Fuel fillers on both gunwales, mooring cleats in the transom corners, and a moulded step leading to the sidedeck are thoughtful touches. Grab rails on the groovy targa arch or spoiler, which is a seamless moulding, help your passage forward. The big foredeck wasn't fitted with a sunpad - something I would definitely want in order to create a separate lounging area up front - but Sea Ray offers one as a listed option. The transom door and hatches are injection moulded with glossy gelcoat finishes inside and out. Another smart detail is the infra-red sensor that prevents you from raising the push-button cockpit floor to check the engines without first locking the transom gate out of the way. There is room to seat six guests in the cockpit on a U-shaped lounge to starboard. A removable table, stowed in the engine room, can be added for lunch or drinks. The table has four drinkholders and an adjustable base with an infill cushion that lets your create a sunpad/sleepout for those hot summer nights afloat. A storage pocket for personals and a useful amenities centre with moulded oval sink, optional fridge, drinkholders, grab rail and storage locker are included in the cockpit. Beneath the co-pilot's seat is a removable Igloo cooler so you can stage a picnic ashore or transport the prawns from the fish markets. The main reason people are jumping aboard sportscruisers is the single-level cockpit that lets you take the helm and hobnob with friends at the same time. This boat's helm seat is flanked by the co-pilot's seat so that couples can also cruise as one. Flip-up bolsters let you drive standing, with a clear view over the windscreen. Seated, the view through the screen is clear, too. A sidepocket is handy for the skipper's personal items and a push-button vent in the windscreen keeps the fumes at bay if the clears are up. The low-glare beige dash is among the most automotive this writer has seen on a boat. In place of the usual switches are multifunction soft-touch pads with relevant icons denoting lights, pumps, blower, horn, wipers and so on. 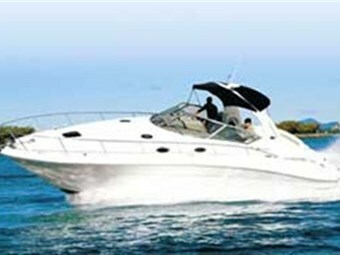 Sea Ray provides separate throttles/shifts with groovy gold anodised knobs, because most Americans like them that way. Single shifts would be easier, of course. There is keyless ignition, a joystick for the bowthruster, searchlight control, trim tab buttons, windlass switch, VHF radio and a remote for the Clarion six-disc CD player within reach of the helm. The optional SmartCraft engine instrumentation includes low-glare blue backlighting and monitoring of air and water temperatures, fuel flow and range, as well as engine synchronisation and GPS interfacing. A system maintenance record helps with problem-solving. 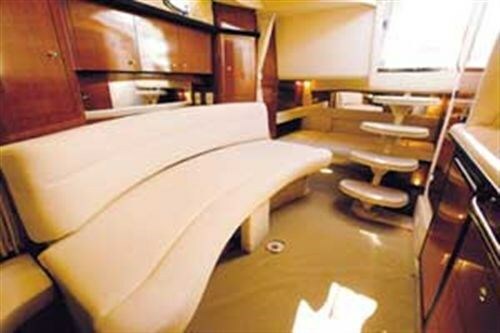 The interior of the 375 Sundancer is clean, uncluttered, open plan and dressed with timeless decor. There is warm cherrywood-look joinery, gold and chrome doorknobs, soft-touch camel-coloured vinyl liners, beige carpet, natural light from numerous skylights, art deco details and mirrors that add to the sense of space. The boat's headroom is a high point, but what came as more of a surprise was the split personality floorplan. 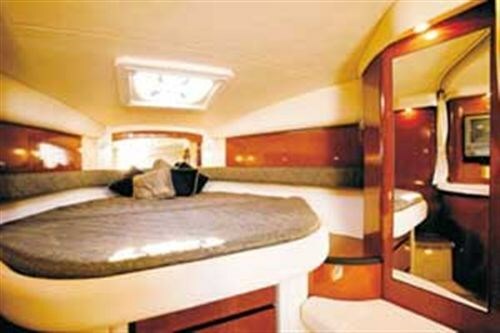 Rather than cram a whole lot of permanent accommodation down below, the 375 Sundancer has a convertible layout. Left open, the aft cabin acts as a lounge or rumpus room and the boat feels like a condo. It could be a games room or a place to enjoy a drink and discussion, or even plan the next day's voyage with a map unfurled on the floor. A ladder instead of a moulded staircase lets light into the lounge/aft cabin and there are places for three to four adults to sit. But should friends stay over, the aft room can also be converted into a second cabin with double bed. The double bed was created after a few minutes of relocating lounge backrests and padded infills. A mirror adds to the sense of space and there are lockers for stowing clothes. But couples beware - there is only a sliding curtain for privacy. More innovation exists at the dinette. The table is removable to create a long second lounge opposite the galley. If you get stuck for another bed, no worries - the lounge base slides out to create an impromptu single berth. The boat's AC/DC panel and lots of overhead lockers are alongside. Amidships to port is the boat's galley with generous sand-coloured Granicoat counters. There are three big storage lockers, five drawers, a concealed garbage bin and a skylight. Sunbrella runners will help keep the carpet clean. A lid conceals a two-burner ceramic hob and deep moulded sink with Italian-inspired fittings. I noted a handy grab rail in case of passing boat wake. A microwave (not a convection model) is supplied. There is an extractor fan and an opening porthole. The 100lt fridge and small freezer should serve the boat's weekending duties. Forward in the galley cabinet is a small TV/VCR with no DVD. The screen pulls out on tracks and swivels so you can face it towards the lounge opposite or the double berth in the bow. The permanent vee-shaped double bed in the bow is adult-length and flanked by lockers and shelves for holding bedding and clobber. A half-length hanging locker provides somewhere to swing the suit. The bedhead has an art deco line and is padded so you can sit up and read. The head - located conveniently near the companionway - makes the 375 a great host. Although you step up to the bathroom, there is still full headroom inside. The loo is a Vacuflush model and the handheld shower attaches to a clip on the wall. Fittings include a towel rail, mirror and storage lockers. I donned the shades, ditched the mooring lines and decamped from Marina Mirage, intending to cruise down the Broadwater. But there was barely a ripple offshore and, well, a lot more room to let this boat have its head. The big-block V8s have no trouble getting the deeply-veed hull out of the water. The hull does 7.7kt at 1700rpm and can hold the plane at 2700rpm and 12.5kt with the tabs down - handy for really rough weather. But the sportscruiser is far happier at 3200rpm and 17kt, where there is no need for tabs, and it cruises freely at 3800rpm and 24.2kt. A smooth cruise of 26.5kt at 4000rpm and a fast cruise of 32.3kt at 4500rpm were recorded offshore. The 21° hull cleaves the waves and the boat is fast enough to leave the spray in its wake. I nailed 34.6kt at 5200rpm back on the Broadwater. The boat's sporty handling impressed. In true sportscruiser fashion, you can drive the boat off the wheel and jack into tight turns. Afterwards, I noted loads of servicing room around the motors, which suggested other engine options. These include twin petrol or diesel inboards in vee-drive configuration with shafts. While maintenance might be less than with sterndrive, you won't get the hot handling of the Bravo Three drives. Either way, Sea Ray's 375 Sundancer is destined to call a five-star marina home. The boat would be a beauty for Sydney, Perth or even Melbourne, once it has a few more marinas on line. Given more time I might have pulled into Sanctuary Cove for 18 holes, dinner at the boat club, and a visitor's berth to sleep it off.